This buying guide is meant to give the reader enough information to approach the purchase of a modern V8 Ferrari armed with enough facts to be able to make an informed choice. It is not a substitute for a professional inspection and I strongly urge prospective purchasers to seek a professional, independent inspection before buying. Independent means someone without any interest in the car whatsoever. If a car has been serviced at a garage in the past then, in my opinion, they are not suitable to pass judgement on the condition. This is where I start when assessing a car for sale, I will ask the vendor to send me the dates, venue and details of each service. It is a useful way to filter out bad cars and save unnecessary viewings. 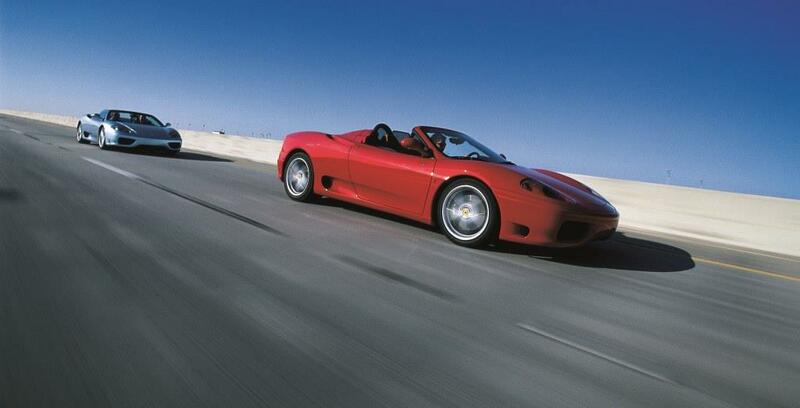 Both the 360 and F430 have similar servicing schedules – annually regardless of mileage and mileage intervals. Additionally the 360 has cambelt replacement intervals of three years (the F430 having chain driven camshafts). The mileage intervals are 6,250, 18,750, 31,250, 43,750, etc. In theory the car should be serviced on the anniversary of it’s first registration as well as every time it hits those mileages. In practice, a FSH will comprise yearly services being a mix of annual and mileage types (with cambelts every three years for the 360). The lack of regular oil changes can ultimately led to engine failure. Both the 360 and F430 use titanium connecting rods in the engine which can be damaged by dirty oil. Combustion gases escape past the piston rings and into the crankcase, contaminating the oil which turns it acidic and starts to corrode the conrods. If the corrosion is too severe then the bearing will fail, requiring an engine rebuild. Additionally, the oil pumps in these engines chew up the long chain polymer additives in the oil much faster than in a regular car. The shortening of these polymers reduces the oil viscosity which in turn increases engine wear. 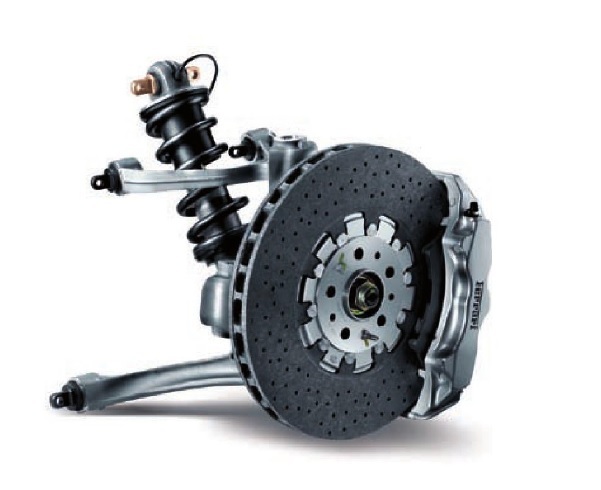 The lack of regular brake fluid changes can cause havoc with the braking system. Old brake fluid solidifies in the system – at best this will mean replacement of the brake lines and/or hoses. At worst it can lead to failure of the ABS module, a £2,000 part. If a 360 goes beyond the cambelt interval of three years without new belts then it is not a deal breaker in my opinion. However, one should factor in the price of changing the belts and tensioner bearings. This low interval is driven by the fact that these engines tend to spend their time at high rpm. The flat plane crank configuration gives off some very destructive vibrations at these speeds, coupled with the velocity that the belts and tensioners are moving means that the risk of failure increases if the interval is stretched out. However, if a car has made it without fresh belts then that in it’s own is not a reason to walk away (what it says about the owner is another matter). 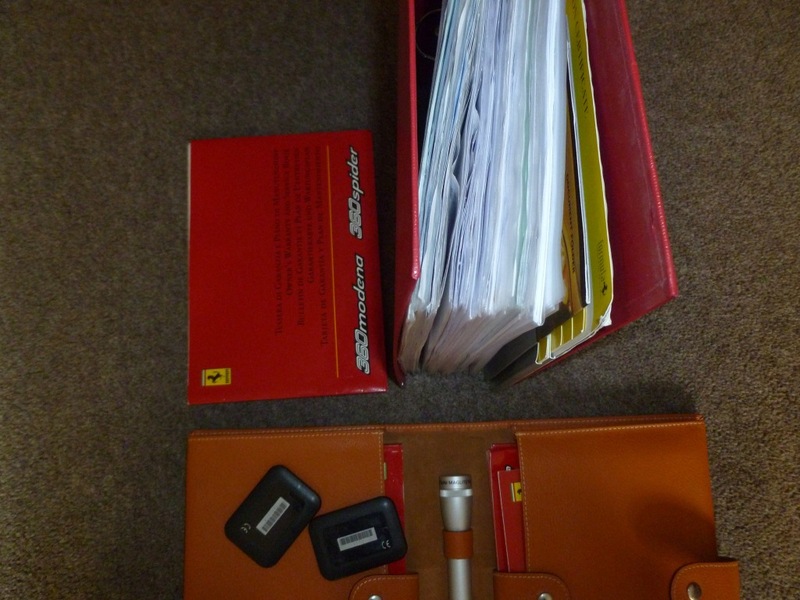 Prime cars will have a book full of stamps from franchised and known independent workshops, complemented by a folder of receipts (see a good example in the photos above). It is up to the buyer to decided how long a gap in the history they will accept but I wouldn’t want to buy a car with two years or more between any service. The only exception to this would be if a car was put into storage immediately after a service and then serviced again before being returned to the road (and there were supporting documents). Please also be aware that there are a small amount of cars out there with a fake history. Both the 360 and F430 engines are strong and have been proven to last over 100,000 miles between rebuilds – providing they have been serviced correctly. The 360 puts out 400bhp, all at the top end, whereas the F430 has another 85bhp but crucially has an later (and much greater) peak torque which remains higher than the 360 even when it starts to drop off. The 360 is prone to wearing out the on-plug coils (and I expect there will be similar pathology seen as the F430 gets older). This isn’t too much of a worry if it is rectified promptly (the coils can be bought for less than £50 each) but a failing coil can cause unburnt fuel to enter the exhaust which can ruin the catalytic converter. Both exhaust systems have flaws. 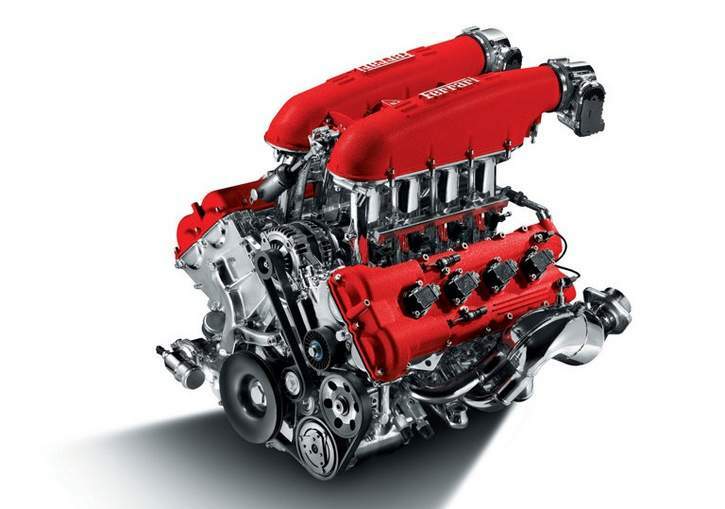 The manifolds (or headers) are prone to failure although the 360 less so than the F430, which had a revision during production. The mode of failure starts with a crack in one branch which can escalate into more branches failing. Early signs can be a ticking noise when the engine is cold which goes away when warm (as the metal expands and closes the gap). Also, localised bluing of the heat shield can indicate hot gases escaping. The only reliable method of testing is to pump smoke into the exhaust outlet and check for smoke leaking into the engine bay. The F430 has a catalytic converter built into the manifold, commonly referred to as a “pre-cat”. If a broken manifold is allowed to remain fitted to the car, the pre-cat can break up and ceramic fragments sucked back into the engine during the valve overlap, causing significant internal damage. If you suspect this may have occurred to a car you are looking at then ask that the inspection include a visual check of the cylinders via boroscope. Ferrari did update the manifold design and many cars do have these second generation parts fitted – they were introduced at the factory to assembly number 74556 (VIN 157672) and many earlier cars have had them fitted as part of warranty claims. You can visually tell if the manifolds are the later type by looking at the position of the Lambda sensor – Mk1 manifolds had the Lambda at the join with the catalytic converter whereas the Mk2 had it positioned at the centre of the manifold. Although stronger, these manifolds can fail and the only solution, in my opinion, is to fit after market manifolds. The exhaust silencers are also an issue on both models. Both types have a similar construction – the silencer itself is encased with a solid white heat insulator before being wrapped in a thin sheet of stainless steel. The insulation brakes down into a powder with ages and escapes past the outer case and into the engine bay. There is no risk to the car apart from a dirty engine bay. The only way to prevent this is to fit an aftermarket exhaust. The engine mounts suffer from the vibrations given off the flat plane crank configuration. Replacement at around 20,000 miles is not uncommon. The 360 can suffer from the intake manifold gaskets failing. Although the parts are cheap, the labour to replace runs at around 8 hours. Early 360s suffered from cam timing variator failure. Almost all cars will have had the updated part fitted so this is a non-issue. 360s are fitted with variable length inlet manifolds. The butterflies that control this feature can rattle so listen for top end noise (on really bad cars it can sound like the valves are about to exit the engine). To confirm the noise is just the butterflies reach in and manually actuate them – as soon as you touch the lever the noise should disappear. Inlet manifolds can be re-bushed but the noise will never completely go away. There is a choice of manual or F1. Both types of transmission share the same gearbox (although the ‘box is different between the 360 & F430). The F1 is best described as an automated manual – see here for an in depth description of the 360 system. Gearboxes have been proved to be reliable, providing they are serviced correctly (I prefer to change the transmission oil annually). The F1 system is hydraulically actuated – check for leaks where the actuators interface with the gearbox. Pump failure is not uncommon on the 360 – the relay wears out and the contacts can weld shut, forcing the pump to constantly run until it fails. 360 pumps are relatively cheap as they are shared with cars in the Alfa Romeo range. Despite having a better relay, early F430s can also suffer from pump failure as it is required to power the E-Diff as well as the F1 system. Later cars came with a more powerful pump fitted and early cars can be retrofitted (early pumps are silver, later ones black). The change over happened at Assembly Number 61589 (F1) and Assembly Number 61701 (Manual). The F430 comes supplied with a sophisticated electronic differential (E-Diff). This controls the power going to the rear wheels by applying hydraulic fluid to the differental as well as independently braking each rear wheel. Cars that have been heavily tracked can wear out their rear brakes well in advance of the front brakes so check the condition of the discs. There have also been reports of the control solenoid valve failing so it is important to have any error codes read from the gearbox by someone who knows what they are looking for. F1 cars have a clutch wear index recorded in the TCU. This is an estimated amount of wear that the clutch has suffered and can give an indication of how much clutch is remaining. Another indication of an F1 clutch being worn is the system suddenly shifting into neutral. A correctly set up and considerately driven F1 clutch can last well over 20,000 miles, one that isn’t can wear out in under 10k. If a car needs a clutch replacement and continues to be driven around then there is a danger that the flywheel can overheat and begin to dish. Manual cars do not have a wear index so test the clutch like you would any other car. The take up from standstill should be crisp with no juddering or slippage. Put the car in a high gear and floor the throttle – there should be no hint of slippage. A considerately driven manual car can go over 35,000 miles between clutches. There is a water-oil heat exchanger fitted to both models. The 360 has been known to fail so check for any contamination in the coolant. If a failure is not detected early enough (usually by observing a drop in coolant level) then the gearbox can require a rebuild. The 360 gearbox mounting bush (under the exhaust silencer) is also prone to wearing out. A visual check is usually enough to determine if there are any issues. The improved version from the F430 is usually fitted when replacing. Manual cars can suffer from a worn bush under the gear lever. This causes a certain amount of slack movement when moving the gear stick from side to side. Replacement is relativity inexpensive. The 360 came fitted with 330mm diameter vented and cross drilled steel discs on both the front and rear as well as powerful four pot Brembo calipers. Check for the usual worn discs, uneven markings and pad thickness. When braking from speed the car should pull up strongly and without pulling to one side and with no vibration through the pedal. If any of these occur then there is an issue somewhere (most likely either solidified brake fluid in the system or uneven transfer of pad material onto the disc). 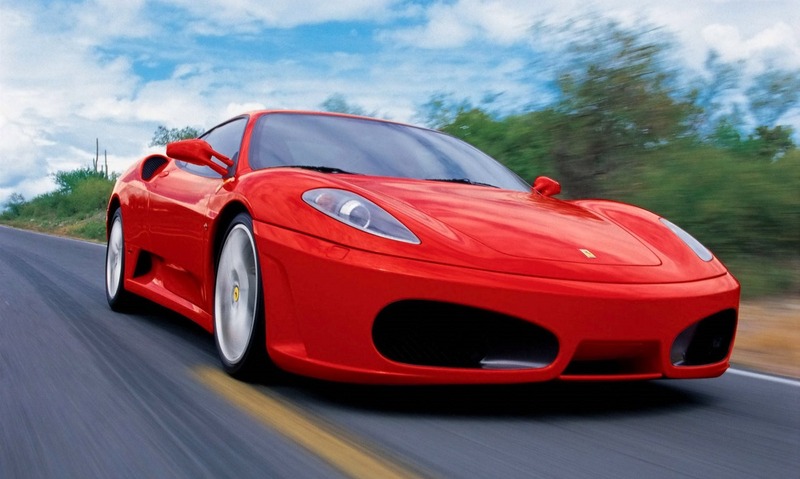 The F430 was supplied with a choice of the steel brakes as fitted to the 360 or with Carbon Ceramic brakes. The latter being 380mm diameter on the front and 350mm on the rear, as well as huge 6 pot calipers. Contrary to CCM brakes fitted to other marques, the Ferrari items can wear out especially if the car is tracked (check the rear discs as the ASR uses these brakes to vector the rear of the car). 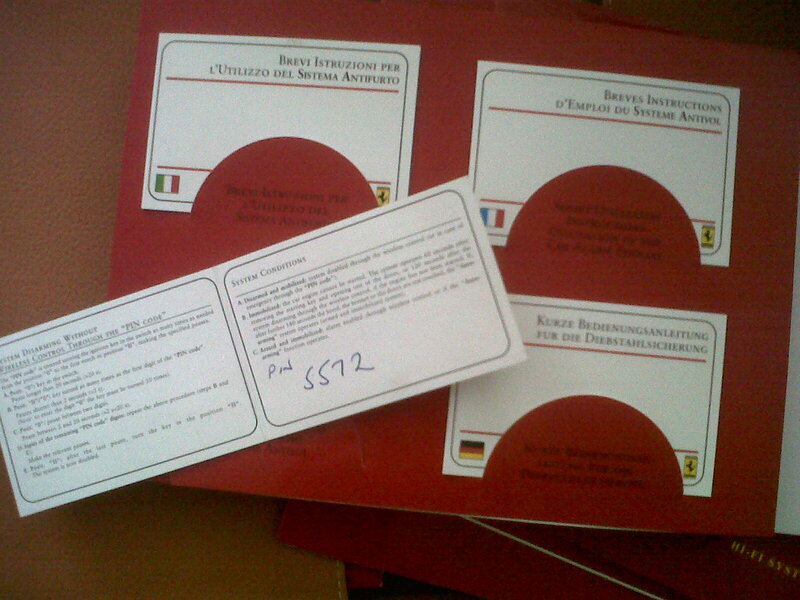 The car stores an estimated wear percentage in its memory which can be accessed using Ferrari diagnostic tool. The wear manifests itself as chunks of the material actually falling off the surface of the disc so a visual inspection can reveal a lot. Some CCM brakes will have been retro fitted. Part of the package is to change the servo but this is not always done – if the brake pedal feels difficult to press onto then the chances are the servo is the wrong type. In 2008, the F430 was supplied with CCM brakes as standard – they were fitted to Assembly Number 64741 and above. Both the 360 and F430 share the same all aluminium Alcoa chassis, although the F430 was strengthened a little to increase stiffness. Both models have the exact same doors, bonnet and roof. Underneath, the hubs and wishbones are the same. The panels should be straight and true with even gaps. Any deviation from this points towards accident damage and you should investigate further. Most accidents are either front end impacts or rear quarter side impacts (from a spin). Check the where the front wings meet the chassis next to the front boot weather seal – there should be no evidence of repair. At the back check the fit of the rear quarter panels. Check the lip of the wing inside the front wheel arches. Heavy cornering (such as on track) can result in the tyre contacting the inside of the wing, pulling the lip down. If this has happened you will see a crease in the metal lip where it meets the plastic arch liner. Carefully check for panel corrosion – the car is all aluminium so corrosion tends to manifest itself as bubbling under the paint surface. Check for evidence overspray. There is clear protection film fitted to the trailing edges of the wheel arches and the air intake of the sills – check this is present and has not been over painted. Most front bumpers will have been repainted due to stone chips. Check for a good colour match (silver and grey are hard to match) in both natural and artificial light. Look under the front bumper – the nose is low and prone to scraping on speed humps. Also check the fastenings of the bottom of the front bumper to the undertray. The front boot weather seal can leak so check the carpet in the front boot for dampness. Also check the condition of the scuttle panel (look for white powder) as cars kept outside can suffer from corrosion in this area. Check how the top of windows fit in the seal. The drivers side may require adjustment as they can drop down. Many cars will be advertised with HID or Xenon headlights. If the front bumper does not have headlight washers then the headlights were converted using an aftermarket kit and it would be wise to check this was done correctly (note this is for Euro cars – Federal spec cars did not have the headlight washers). Check the operation of the exterior door handles, including excessive play, as the operating cable is prone to failure. Also check for broken check straps between the door hinges as they have been known to fail. Check for discolouration of the A-pillar black trim as they commonly go grey. Refurbishment is in the form of re-painting black. Check to see if the drivers side wiper mechanism is touching the trailing edge of the bonnet. Repair is usually in the form of bending the arm back into shape but if this doesn’t work the part is £160 to buy. Both models are prone to wearing out the wishbone ball joints – the Ferrari part is chrome plated steel which rusts. There is an alternative to fit aftermarket stainless steel items for approximately £150 each (plus labour). Check for a knocking noise when driving. The track rod ends are also suspect able to failure. Wiggle the steering wheel with your foot on the brakes – you shouldn’t feel anything through the pedal. Replacements can had fairly cheaply. The shock absorber bushes also wear but can be changed at low cost. The suspension has two modes – normal and sport (360) or sport and race (F430). Drive the car in both modes and check for error messages on the dash. When driving there should be no pulling to either side, apart from a tendency to follow the camber of the road. The cars are very sensitive to tyre pressure or it could mean the geometry is out. The Spider roof on both the 360 and F430 is the same. It is German made and has proven to be reliable. Cycle the roof a couple of times and make sure it opens and closes properly. There should be no contact noises when moving (the hydraulic rams are very powerful and strong enough to break the magnesium frame). Check the cover trim and “ear” flaps for contact damage. Pause the roof part the way through the cycle (remove the key to prevent accidents) in order to check the hydraulic rams for evidence of leaks. The interior is very hard wearing on both models with just the drivers seat bolster suffering the most wear. Check the carpets for dampness/mould which may indicate a leak from the window. Early 360s had a textured finish to the aluminium door trim and centre console – this can become very dirty over time and be difficult to clean. Check all switches and buttons work properly. Check how the switch panel to the lower right of the steering wheel (RHD cars) fits into the dash. It is frequently impacted by the driver’s knee when entering/exiting the car and can break the fixing tabs. Check that the alarm LED goes out once the engine has been started (the LED is located below the switches referenced above). If the LED remains lit then the alarm siren battery will have died – a £250 replacement. All Ferraris suffer from sticky switches. There is a cure for the window switches but other parts will have to be stripped back and re-painted if they are really bad. Check that the heater blows hot and cold. Bizzarely, hot will only work if the AC button is pressed. If there is no hot air then the TGK valve may be faulty. Check for finger nail marks in the dash leather above the instruments. Also check the condition of the rubber coating on the F1 paddles. Check the operation of the radio and, if it is OEM, that the security code is supplied. Check that the instrument cluster lights up properly when the headlights are switched on. The backlights are made from a luminescent panel that is expensive to replace. Due to the way Ferrari values are so sensitive to mileage, clocking is a real and present problem. Sadly, many owners wouldn’t think twice of removing a chunk of mileage before their car goes in for it’s service and MOT. Aside from the legal and moral implications, it means that these cars are not serviced properly. In my experience it is more prevalent with the F430 than the 360 but any PPI should include the verification of the mileage on the odometer. Many people know that the F1 TCU records the distance traveled in every gear – this is not adjustable and is the first port of call for checking a car with F1 transmission. However, there are many other areas that can also be checked so a technician that is skilled in the use of an SD2/3 can also get a very good idea if a car with a manual gearbox has also been clocked. The 360 comes supplied with a tool kit and a can of foam to fix punctures. Check these are present and that the tool kit is complete – there should be a towing eye in the spine. Check the foam hasn’t been used and put back empty. 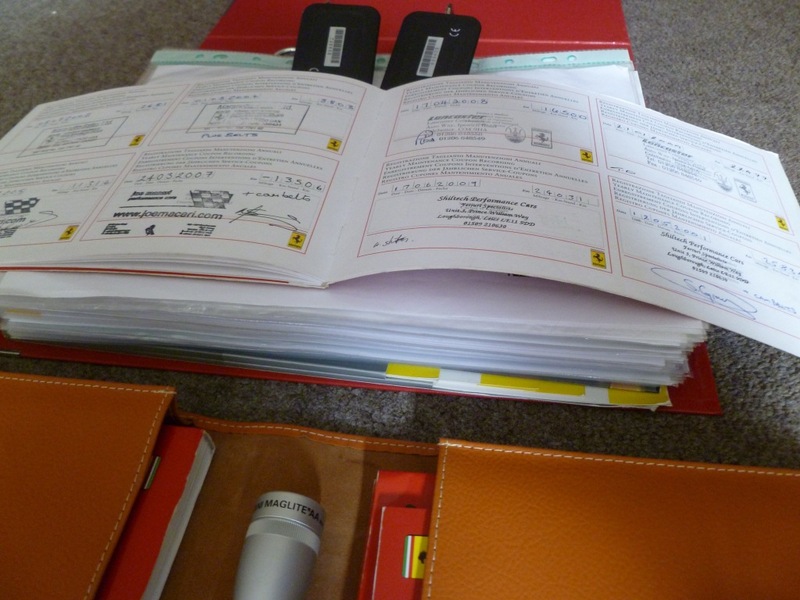 The F430 also has a tool kit and an emergency inflator kit. Check these are present and complete (including the towing eye). The 360 was supplied with two keys and three remote control fobs (2x black and 1x red). Check all operate properly. Check the documentation for the Alarm PIN. This four digit number allows a new set of three fobs (cost approx £250) to be programmed to the immobiliser (see photo of the PIN card below). Without it, a new immobiliser unit is required if you want new fobs. The F430 was supplied with two keys that have a remote control function built in. Check both operate properly. Both models were supplied with the option of a tracker and most cars have one fitted. Early 360s don’t require a fob but later ones and F430s do, so check the fobs are present. Both models would have been supplied with an indoor car cover, two seat covers and a steering wheel cover (all in red velvet). It is likely that these will be missing. Be wary of cars that have had the battery run down. It’s not a deal breaker but great care should be taken when jump starting and a new battery should be fitted ASAP. It goes without saying that the VIN should be checked for outstanding finance or if they have ever been subject to an insurance write off. Cat C/D cars are out there – their value is significantly reduced and will be difficult to sell on. Cars that have taken a heavy hit are also unlikely to ever drive correctly again. Both the 360 and F430 are reliable cars providing that they have been looked after correctly. Buying a prime car and staying on top of the maintenance can ensure that ongoing costs are generally limited to fuel, tyres and regular servicing. Buying a car full of deferred maintenance can be time consuming and expensive to bring back up to scratch.